English Teaching Zone: Fun classes with a simple DECK OF CARDS!!! Using a standard deck of cards can offer a variety of grouping styles. Each student is given a card off the top of the deck and then they are informed to find all four suits of their card. So if someone had a seven there would be a grouping of four. The group would consist of the 7 of hearts, 7 of diamonds, 7 of clubs and the 7 of spades. If you wanted pairs formed, students would find the same color of their card. 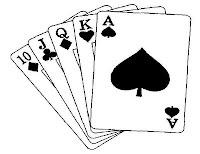 For example a student with a 2 of hearts would look for the student with the 2 of diamonds. To get students started; perhaps offer a beginning to the story. They then must continue making an oral story by drawing one card and continuing the story along those lines. For example, if they get 4, then the teacher/protagonist must do something heroic or some kind of heroric event must occur. If the students draw a K (or whatever card you stipulate), then they can change one option. This seems to help keep the momentum in the game. Continue through all cards, with the stipulation that the story must be concluded by the end of the deck. Obviously there is a lot of room for variation here. 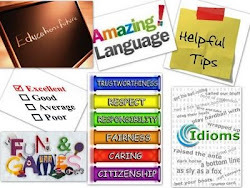 Your word list and theme could be related to your unit of study. As a follow-up or homework activity, you can ask students to write about the most interenting event.